Constantly sitting your laptop on your lap can be uncomfortable and dangerous. Many individuals have experienced skin problems from the heat of the laptop on the legs. Others have had leg problems due to the weight of the laptop sitting on their legs. The good news is that you can find a way to use your laptop in comfort without having it sit right on your legs. With a multi-function laptop desk, you can easily use your laptop while sitting on the couch, in bed or in other areas around your home or on the go. The design of a multi-function laptop desk not only helps avoid heat transfer to your legs, but it also helps to make sure that you are not hunching over a laptop sitting on your lap. The foldable laptop desk can be adjusted so your laptop is right at eye level, allowing you to easily see your screen and type on the laptop without a problem. This way you can keep good posture and avoid neck or back aches. It is nice to sit back and relax while using your laptop. One of the benefits of using a multi-function laptop desk is the ability to use it in many different places. Do you enjoy sitting on the couch and using your laptop? If so, you can easily use this foldable laptop desk right on the couch, allowing you to use the computer in comfort. Maybe you like to take your laptop in the bedroom in the evening for a few games or to do a bit of work before bedtime. The desk easily fits on your bed, making it easy to use your computer in your bed. If you do not have a lot of space, you can also sit on the floor with your laptop, using the desk to hold your laptop. Many people love the adjustable part of the multi-function laptop desk, which makes it easy to change the angle of your laptop so it is at an angle that works well for you. Even the mouse area has an angle riser that allows you to change the angle for the mouse. 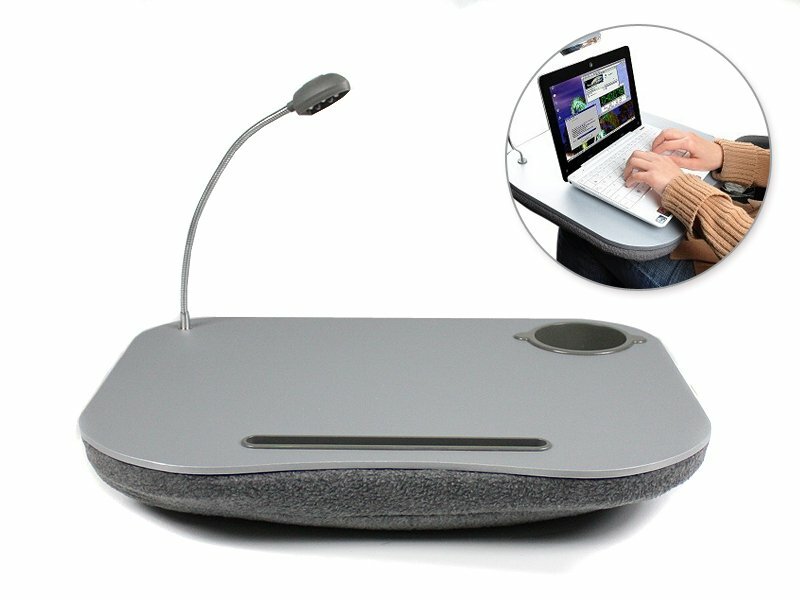 You will also appreciate the small LED light, which can give you light while working in the dark on your laptop or while you are using the stand for reading or other projects. Laptop tables generally are quite expensive, but the adjustable multi-function laptop desk is affordable. For a reasonable price, you can order one of these desks and begin using your laptop around your home in comfort. In fact, the price is so affordable, you may want to buy one for yourself and then purchase another desk as a gift for a friend or family member that uses a laptop regularly. Stop using a pillow to balance your laptop and stop trying to hold the hot computer on your legs. Buy and begin using the multi-function laptop desk and you will have a sturdy, yet portable, table that solves all your laptop problems. Sit back, adjust the table to the right position for your needs, grab a drink to place a drink in the drink holder and enjoy some time on your laptop in comfort. Many people today spend a lot of time sitting and unfortunately, most do not have good posture while sitting, which is hard on the back. Long periods of sitting are already tough on the back, but sitting with poor posture can cause pain and lead to back problems. Simply improving your posture can do a lot to help relieve your back pain, but it can be tough to remember to maintain proper posture while sitting, especially if you have to sit for long periods of time. However, there is a solution that can help – the chair back support system. The Sit Right back support system is easy to use and helps you maintain good posture while sitting, allowing you to quickly feel the difference in your back. Here is a closer look at this chair back support system and the benefits it has to offer you. What is the Chair Back Support System? The Sit Right back support system is a system designed to work with any chair, offering a spring cushion effect that keeps you comfortable while making sure that you maintain proper posture while sitting. The product is made of mesh, so it will not make you hot while you are using it. It also includes raised nodes that are supposed to massage your back, helping to relax those back muscles as you sit. This chair back support system offers many different benefits that you can enjoy. One benefit is that the system is so light weight. Since it is light, it is easy to carry with you, so you can take that support with you wherever you want to sit. Another benefit of the Sit Right back support system is that it really does fit most chairs. It has straps on it that you can pull over a chair, securing it so it doesn’t slide around. Since it easily fits many chairs, you can use it at work, in the car and even at your desk at home. Most of the product is made of mesh, which allows you to stay cool, which is important when you spend a lot of time in a chair. When you use the chair back support system, you will find that it makes you keep good posture. You cannot slouch when using the system, so you will sit properly and put less pressure on the spine when using the system. Many people wonder if this chair back support system will give them the unique support they need. The Sit Right back support system is actually designed to fit most backs, so it will conform to your back, giving you the support that you need. Another benefit is the low price of the product. The price is reasonable enough to buy one for work and one to use at home or in your car. When you need to relieve the back pain you experience from sitting all the time, the chair back support system is definitely a great option to try. You can use it nearly anywhere, it is easy to add to any chair and it will change your posture. Once you improve your posture, you should notice that you are no longer experiencing as much back pain after long periods of sitting. Do you look at the big mess behind your computer or television and feel embarrassed? All those cables can be an eyesore! Not to mention they make it extremely difficult to unhook and move TVs, computers or AV gear around. Maybe you’ve heard that you can buy cable tidy online. It’s a product that can help you to keep all those unsightly cables organised. You might be wondering if this product really works and gives the results you need. Here is a Cable Tidy review, offering you a closer look at the product and what it has to offer. You probably want to know how this product actually works. Basically, this product allows you to place all your cables into one larger channel. Pull together your cables and the Cable Tidy lets you zip all the cables up into its handy, plastic channel. Not only does this reduce all the clutter behind your television and computers, but it also helps you baby and toddler proof your home if you have young children. It also adds safety if you happen to have pets inside the house. The product can be cut down to the perfect size for your needs, which makes it a workable solution for almost anyone. When you buy Cable Tidy online, you’ll find that the product is extremely easy to use. In just a few minutes, you can have all those cables cleaned up. In fact, most people who have tried it found that it was so easy to use that they immediately went out and purchased more of them. If you need to trim the Cable Tidy down to size, that’s easy too. You don’t need anything heavy duty. Just a simple pair of scissors will do the job for you. The box also offers you easy to follow instructions, so you won’t have any trouble being able to use this product. When writing a Cable Tidy review, we found that the product is a great investment for the money. No doubt, you want to avoid breaking the bank to organize all those cables. The great thing about Cable Tidy is that it is reasonably priced. With just one product, you can deal with all the cables in one area, like the study or the lounge room. If you have other areas where cables are a problem, the product is affordable enough that you you’ll be happy to invest in another one. Since it improves the look of any room and offers better safety in your home, it is definitely an investment worth making. All you have to do is check out the cable tidy reviews of consumers who have used it and you’ll notice that many have very positive things to say about the product. Some users have noted that the product can take care of your cable problems in just a couple minutes. Other consumers have reviewed the product and noted that they now use Cable Tidy in their bedrooms, kitchens, craft areas and workshops. Consumers love the low price and how easy this product is to use, which is why so many continue to buy Cable Tidy online.